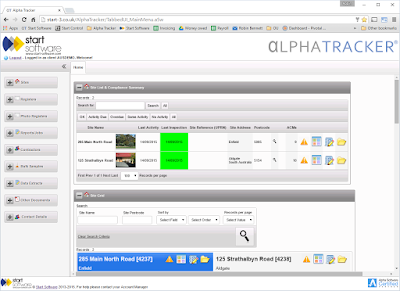 We use the Alpha "App Server" software to power our asbestos software system Alpha Tracker and a number of other software products. The current release of the Alpha App Server is reliable and fast but when our largest software installations require the highest throughput or resilience in the event of a system failure we have to install multiple copies of the App Server which makes maintenance a bit of a pain. We learnt at the Alpha "DevCon" in Boston last week (see this blog post) that the integration of the App Server into Microsoft's IIS product is nearly complete (see this earlier post) and that there is also a 64-bit version of the App Server in development. Both of these will increase the robustness and the scalability of the systems we provide. If you would like any more information on these developments or our technology road-map, do get in touch. 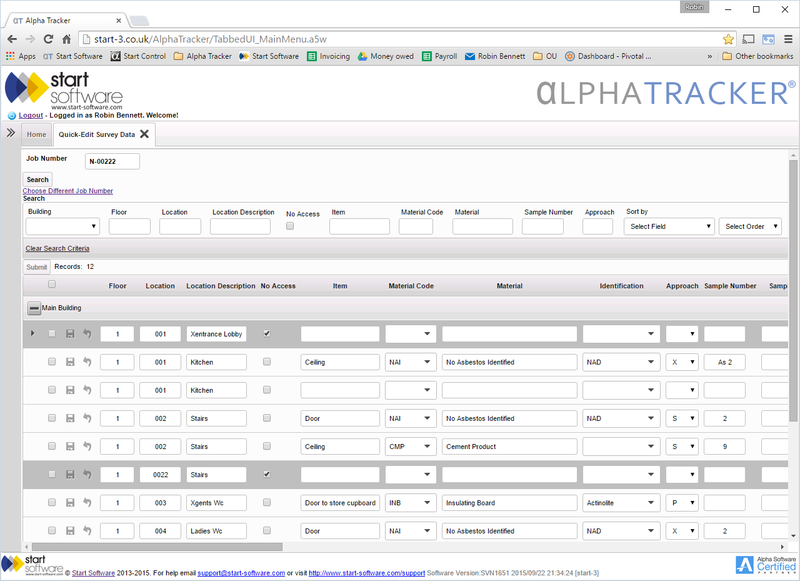 Our asbestos software system Alpha Tracker has been updated again with the September 2015 release. This version (known as SVN1600) has 50 or so new features, performance improvements and bug fixes since the August update. The Alpha Tracker Client Portal "site compliance summary"
We're working hard on the October update for Alpha Tracker and we're at "beta 12" already - keep an eye on the blog to see the new features next month. I'm writing at the airport on the way back from the annual Alpha Developer Conference ("DevCon") where I get chance to catch up in person with the Alpha Software development team and fellow Alpha professionals from around the World. As usual, I've come back full of ideas and inspiration after seeing some truly cutting-edge new software development technology which we'll be able to make use of over the next 12 months. I was also very impressed with Michael Facemire's presentation where he discussed how app development lifecycles have to be completely different to traditional software builds - and I think we've really missed a trick here at Start Software and it is something I'm going to put right. 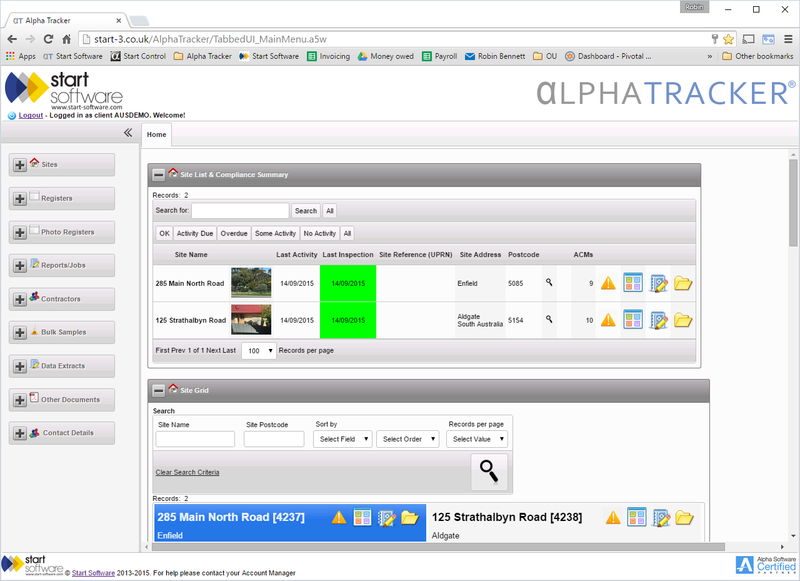 If you want to know more about the latest Alpha technology which we'll be using in our range of software products including our asbestos software system Alpha Tracker, do get in touch. We've had a busy week with more software updates released for our asbestos software system Alpha Tracker, new clients coming on board and new staff learning the ropes too. 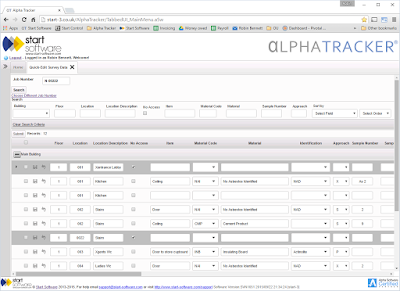 Alpha Tracker October 2015 beta 5 with the first new features for the October release ready for our asbestos consultancy beta testers to look at. Specialist asbestos and environmental consultancy Worcestershire Scientific Services are ready for their admin training now that their asbestos surveyors are trained up to use Tracker Mobile. Keep an eye on the beta releases this month for a major lab update and more performance improvements especially for staff needing to check and correct data before asbestos reports are produced. It was great to see Julie and her asbestos surveyor colleagues this morning and get them trained up to use our Tracker Mobile electronic surveying system. Julie and team and lots of biscuits! Tracker Mobile is part of the Alpha Tracker and Tracker asbestos software systems designed to improve the efficiency and profitability of asbestos consultancies. Do get in touch if we might be able to help your business. Support stats down 10% - holiday season? We've just analysed the support desk stats for August 2015 and our performance is down 10%. It wasn't a particularly busy month (we took 464 calls in total) but we only solved 80% of calls in the time-scales requested by our customers rather than our typical 90%+. We'll keep a close eye on this - was it just that we were stretched with many staff going on their summer holidays? Watch out for an update next month when I hope and expect to be able to report better news. 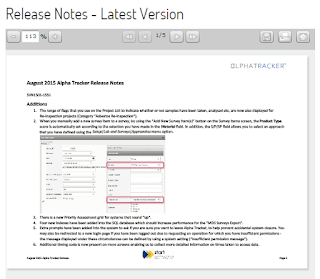 We announced last month that the August 2015 update to the asbestos software system Alpha Tracker was now available (see http://robinbennett.blogspot.co.uk/2015/08/august-2015s-update-for-alpha-tracker.html).